KTNCL-3805NL KLUSON® REVOLUTION DIECAST TUNERS - 6 IN LINE - LOCKING - NICKEL (NO COLLAR) vintage tuners direct retro-fit !!! Home > Brands > KTNCL-3805NL KLUSON® REVOLUTION DIECAST TUNERS - 6 IN LINE - LOCKING - NICKEL (NO COLLAR) vintage tuners direct retro-fit !!! Introducing the NEW Kluson Revolution H-mount 19:1 high ratio locking tuning machine for vintage and reissue instruments. Kluson has truly introduced a game changer with the traditional 6 in line footprint and newly designed sealed die-cast housing. 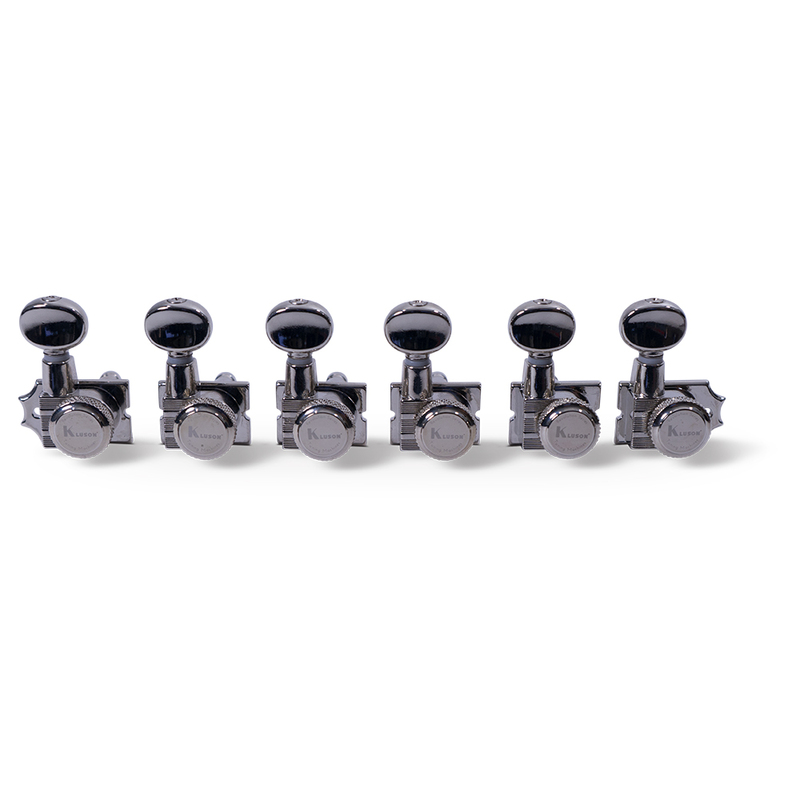 These state of the art tuners are designed to directly retrofit vintage Kluson tuners with a push-in bushing, traditional Kluson 6 in line mounting pattern and 11/32 inch peghole. The vintage outline, metal oval button and pin-stripes pay tribute to Kluson heritage while the brand new housing appearance incorporates all the features the modern guitarist demands. High gear ratio guarantees silky smooth operation, fine tuning stability and no backlash all in a sealed one-piece housing that looks like it belongs in a jewelry case! 6 in line tuners for right handed or non-reverse headstock instruments and all mounting hardware is included.